The Smithsonian Institution Building, commonly referred to as the Castle, is located on the National Mall in Washington, DC, and was constructed in the mid-nineteenth century for the purpose of housing all museum and scientific functions for the newly formed institution. Matching gateposts designed by the Castle’s architect were erected more than a century later in the Enid A. Haupt Garden opposite the Castle. Black patches were recently noted on both structures, which are clad with locally quarried Seneca red sandstone. Portable x-ray fluorescence (XRF) spectrometry links the discoloration with elevated Mn concentrations. The discolored patches resemble rock varnish, a Mn-rich coating observed on rock surfaces formed in a variety of environments. Bulk rock and varnish chemistry, in addition to microscopy and microanalysis of the varnish, are presented here. On a bulk chemical basis, the Seneca sandstone is relatively poor in Mn, containing ~500 ppmw. In contrast, the rock varnish is greatly enriched in Mn relative to the stone and to a lesser degree in Pb, Ca, Zn, Cu and Ni. Cross sections of the black encrusted regions show that the stone’s red coloration has been modified by black pigmentation from the surface down to ~250 μm. X-ray diffraction of blackened particles produced no discernable pattern, indicating concentrations below the detection limit, poor crystallinity, or both. 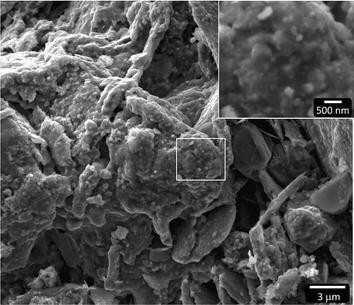 Scanning electron microscopy and EDS-based x-ray microanalysis of the uppermost portion of the cross section reveal nanometer scale (<20–200 nm) Mn-rich and clay particles concentrated in a thin film (≪1 μm) at the surface. Additionally, Mn oxide particles decorate the surfaces of fine-grained minerals in sandstone pores within the discolored zone. Imaging and microanalysis of the rock surface reveal that the Mn-rich varnish is a discontinuous film ≪1 μm in thickness with an estimated composition of Na0.2Ca0.1Mg0.1Al0.1Si0.5Mn1.9Fe0.5O6.7. This composition most likely represents a nanoscale mixture of a Mn oxide (e.g., birnessite or todorokite) and an Al-rich silicate mineral. Seneca sandstone on the Smithsonian Castle and gateposts is discolored in patches owing to the Mn-rich phase being deposited into two zones: (1) a vanishingly thin patina, and (2) nanoparticles coating grain boundaries and pores in the uppermost ~200–250 μm of the stone. While the mineralogy is similar to well-studied varnish formed in arid settings, rock varnish on the Smithsonian structures is significantly thinner. Because this architectural rock varnish is young, it may represent the earliest stages of formation of the more commonly described varnishes reported in the literature. 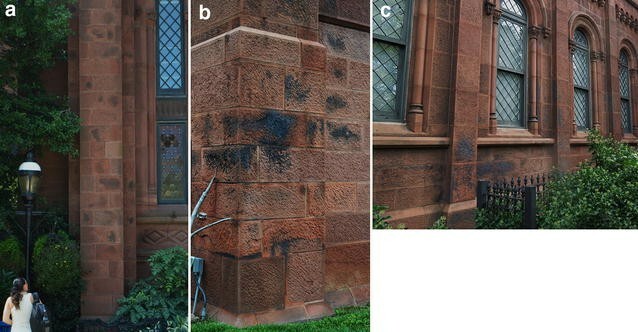 Black or blue black patches were photographed on the Castle and Haupt Garden gateposts beginning in 2007, but the hypothesis that it was related to rock varnish was not made until 2013. Field measurements using portable x-ray fluorescence (XRF) spectrometry linked the discoloration with elevated Mn concentrations . This discovery was confirmed by energy dispersive x-ray spectrometry (EDS) in the SEM . The facades of other red Seneca sandstone buildings in Washington, DC, suffer similar disfiguring black patches, e.g., Oak Hill Cemetery gateposts (1850), also designed by Renwick, and the Cathedral of St. Matthew the Apostle (1893). The black discoloration is best described as rock varnish, a thin dark coating on rock surfaces found in all environments but most easily noticed in arid settings where unvegetated geological features prominently stand out . Varnishes are heavily enriched in Mn relative to the rocks they coat, and previous investigations have determined their mineralogy [8–10] and outlined the evidence for microbial activity in several rock varnishes . Desert varnish study is an active discipline given its relevance to paleoclimate research [12, 13]; prehistoric artifacts and the history of petroglyph surfaces [14, 15]; and its potential application to astrobiology and planetary environments . To the best of our knowledge this study represents the first significant examination of rock varnish on architectural stone. Hand specimen analysis by XRF, scanning electron microscopy, and detailed x-ray microanalytical tools have been used to characterize the rock varnish found on the Smithsonian Castle and gateposts in Washington, DC. Bulk chemistry was determined by instrumental neutron activation analysis (INAA) at the University of Missouri Research Reactor Center. Established standardization and analysis methods  were used to determine elemental concentrations, including an interference correction for aluminum fast neutrons on magnesium. Because silicon was not determined directly, silica was computed by subtracting the sum of all measured oxides from 100. Therefore, these silica values are subject to considerable uncertainty given that other elements, e.g., H and P, were not measured by INAA. Major, minor, and trace elements were analyzed using a Bruker Tracer III-SD hand-held x-ray fluorescence (XRF) spectrometer. A rhodium x-ray source with an energy of 40 kV, beam current of 20 μA, and an x-ray spot size of ~5 mm was used to collect x-ray spectra for 120 live seconds. The Bruker yellow filter, 0.001″ Ti plus 0.012″ Al, was used to reduce background intensity in the energy region of interest. The silicon drift detector (SDD) operated with dead times less than approximately 10 %. The x-ray continuum was subtracted, and corrections for interfering peaks (e.g., Mn Kβ on Fe Kα) in reporting elemental net intensities were determined for XRF spectra using Bruker Artax data evaluation software v7.2.5. Scanning electron microscopy and EDS-based x-ray microanalysis were conducted using three instruments: (1) an FEI Nova NanoSEM 600 field emission SEM equipped with a 40 mm2 Thermo Scientific NanoTrace SiLi x-ray detector, (2) an Hitachi S3700N tungsten source SEM equipped with a 10 mm2 Bruker XFlash 4010 SDD, and (3) an FEI Quanta 200F field emission SEM equipped with a 30 mm2 Bruker XFLash 5030 SDD. Polished cross sections were carbon coated and examined at 12.5 kV at lower resolution and 7 kV for higher spatial x-ray resolution work on the NanoSEM 600 and Hitachi S3700N. Uncoated rock varnish surfaces were imaged at 10 and 13 kV under variable pressure conditions (~0.7 mbar PH2O). These surfaces were then carbon coated and analyzed under high vacuum at 7 kV. X-ray spectra were extracted from hyperspectral data sets and analyzed using Thermo Scientific NSS v 3.2 for polished cross sections and Bruker Esprit v 1.9.4 software packages for rough surfaces. Multivariate statistical analysis of hyperspectral data cubes were performed using NSS COMPASS, which is based upon research performed at Sandia National Laboratories [18, 19]. The interactive peak/background ZAF correction routine was utilized in Bruker Esprit to minimize the effect of rough surfaces on compositional microanalyses. A Rigaku D/MAX RAPID micro-x-ray diffractometer equipped with a semicylindrical imaging plate was utilized for identification of crystalline materials in the rock varnish. Mineral fragments extracted from the rock surface heavily coated with fine-grained black material were selected for x-ray diffraction pattern collection. Irregular black or blue–black patches, measuring as large as 80 cm in long dimension, can be documented on the Castle edifice beginning only in the mid-1990s based on limited photographic documentation of sufficient detail. In 2015 this rock varnish was documented on every face of the building, with the heaviest concentration on the south façade (Fig. 3). The discolored zones are numerous on most façades and are not regularly arranged, nor do they appear to follow either water drainage or soiling patterns (Fig. 4). They are also apparent on the Haupt Garden gateposts, mainly on south faces (Fig. 2). Most patches occur within single blocks, but some span several blocks and are found on mortar in between, as well as on mortar repairs. The bulk chemical composition of Seneca sandstone used to construct the Castle and the Enid A. Haupt Garden gateposts (DC Jail) was determined by instrumental neutron activation analysis (INAA), and results are presented in Table 1 . The two stones are similar in major element composition, although Fe is ~14 % greater in concentration for the Castle compared to DC Jail stone. Most notably, Mn is present at trace element concentrations for both sandstones. Of further note is that Fe is enriched in the bulk relative to Mn by a factor of ~100. Samples of rock varnish were taken from the Haupt Garden gateposts for imaging and analysis in this study for multiple reasons: (1) ease of access, (2) exfoliation of thin layers with rock varnish, making them easy to pry from the stone (Fig. 5a), and (3) a clear time line for rock varnish formation at a relatively youthful sandstone-atmosphere interface. 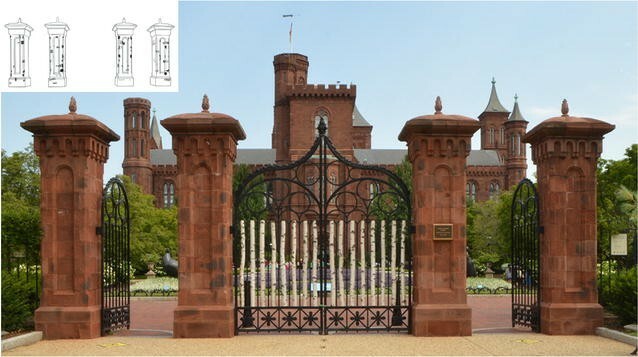 In this study gatepost samples, rather than those from the main building, have been subjected to detailed examination but are referred to as Smithsonian Castle varnish. For the purposes of the following discussion the terms Smithsonian Castle varnish and rock varnish are used interchangeably. Other elements (K, Ti, Fe, Rb, Sr, Y, and Zr) are within 10 % of unity for the above ratio (Table 2). The lone exception is Ga, which is depleted in the varnish, yet this peak has the fewest net counts and is therefore subject to the greatest uncertainty. Because the distinctive x-ray signal from the varnish has an interaction volume greater than that layer, it is diluted by unaltered underlying sandstone. As a result, the portable XRF enrichment/depletion net intensity ratios listed in Table 2 represent minimum estimates. An attempt was made to characterize samples using micro x-ray diffraction to precisely identify the mineralogical assemblage of the rock varnish. Despite careful specimen selection and lengthy acquisition times, the x-ray diffraction patterns obtained reflected the substrate minerals only, with no additional information regarding the varnish phase(s). An image of a polished cross section of varnish flake removed from a gatepost reveals the uniform red color of the Seneca sandstone interior. Loss of red color occurs in the uppermost 0.2–0.25 mm darkened zone though the thickness of this layer is somewhat variable (Fig. 7). Absence of red in this layer is likely due to the strong pigmentation of the Mn-rich phase. A detailed examination of the cross section using SEM imaging and x-ray microanalysis reveals that Mn is found throughout the discolored layer. However, Mn is particularly enriched in the uppermost 100 μm or so, and the density of Mn-bearing particles tails-off precipitously with depth from the rock surface (Fig. 8a). In terms of mineralogical make-up, the most abundant detrital grains in this section of the Seneca sandstone are quartz, plagioclase feldspar, alkali feldspar, and micas. Accessory minerals rich in first row transition metals, e.g. hematite (Fe2O3), titanite (CaTiSiO5), and rutile (TiO2) are present at minor to trace volumes. While these minerals typically contain minor Mn, SEM-based compositional imaging reveals no pattern of Mn migration from these interior grains to the rock surface. The smallest Mn-rich particles are not resolvable using an SEM, but it can be stated that the size distribution ranges from <20 nm to rarer larger particles roughly 200 nm in size (Fig. 8b). The composition of Mn-rock varnish cannot be unambiguously determined in cross section owing to the size of the particles (10 s of nm) and the x-ray interaction volume produced by the electron beam (100 s of nm) at low energy. Nevertheless, multivariate statistical analysis of hyperspectral x-ray imaging results shows that rock varnish is composed of two components: (1) a Mn-rich phase with a Mn/Fe ratio of ~2 (Table 3), and (2) an Al-rich phase with Al/Si ratio of ~1, which is not inconsistent with clay (Fig. 8c; Table 3). In addition to deposits at the stone-atmosphere interface, nanoscale Mn particles also decorate the grain boundaries of fine grained material within sandstone voids (Fig. 9a, b, d) and along grain boundaries (Fig. 9c). Characterizing the uncoated rock varnish surface using variable pressure (VP)SEM imaging reveals the discontinuous nature of the environmental patina on the Seneca sandstone at the millimeter scale (Fig. 10a). Moderate magnification imaging shows that most grain boundaries intersecting the rock surface are covered with a film, while some larger flat areas remain uncoated (Fig. 10b). Morphological imaging of the rock varnish surface can be described as an agglomeration of nanometer scale particles (Fig. 11). Despite measurement conditions designed to minimize the depth of penetration of the electron beam and the resultant x-ray generation volume, we cannot entirely rule out the influence of substrate minerals in the analysis. An alternative explanation for minor Al and Si in the varnish analysis is that nanoscale clay and other dust particles are intimately mixed with the nanoscale Mn-rich phase [8, 10]. In either case, given the negative correlation between Mn and Si (R2 = 0.55) and the more weakly negatively correlated Fe–Si (R2 = 0.26), one may estimate the composition of the Mn oxide film at a Si concentration of zero. An extrapolation of these two regressed correlations results in an estimated Mn/Fe ratio of ~20 for “pure” Mn-oxide rock varnish (Table 4). Biological microstructures such as filaments 10 s–100 μm in length are present on the rock varnish and are rich in carbon and nitrogen (Fig. 14a, b). 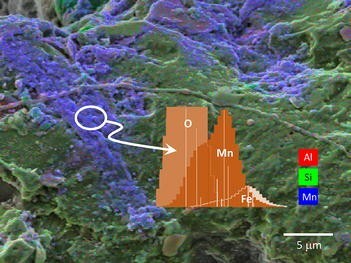 Higher resolution compositional imaging of such microbial microstructures indicates that some biological activity post-dates Mn-deposition (Fig. 14c). Manganese and iron rock varnishes have been noted to occur in a wide range of environmental settings from well-studied examples in deserts around the globe to less studied examples in rainforests of multiple continents, near active glaciers, and on rocks exposed in rivers . Given the latter, it is perhaps not entirely surprising to learn of rock varnish formation in Washington, DC, which is in the humid subtropical zone according to the Köppen climate classification. Average total precipitation in Washington is ~1000 mm per year, or roughly ten times greater than that for an urban desert location, e.g., Las Vegas, NV. Rock varnish on the Seneca sandstone described here shares certain similarities with desert varnish: (1) high luster, nearly metallic in places; (2) Mn-rich particle sizes in the nanometer range from <20 to 200 nm; (3) high enrichment in Mn as well as Pb, Cu, and Zn (Table 2); (4) deposition on a lithological substrate containing a low bulk concentration of Mn (Table 1); and (5) mineralogical association with Al-rich silicate dust minerals intimately mixed with the Mn-rich coating (Fig. 8c). Despite these parallels, rock varnish on the Smithsonian Castle sandstone possesses differences relative to varnish formed in arid settings, namely: (1) Mn is found in two zones, [i] dispersed along grain boundaries and pores in the uppermost 200–250 μm of the rock surface, and [ii] thin and discontinuous surface deposits ≪1 μm in thickness or roughly three orders of magnitude thinner than typical desert varnish. In cross section it is difficult to measure, or even identify, a surface deposit; (2) deposits have no discernable vertically definable substructure as opposed to microstratified desert varnish described in the literature [8, 13]. Differences in both the thickness and lack of microstratigraphy may be attributed to the age disparity between the architectural varnish and those formed over geological periods of time. In this regard Smithsonian varnish may serve as an example of the earliest stage of desert varnish formation. Varnish minerals are either poorly crystalline, present at levels below the detection limit for x-ray diffraction (~5 volume%), or possibly both. Previous researchers have encountered a similar lack of diffracted x-ray signal, even for more developed desert varnish where the coating is significantly more massive compared to samples in this study . Many Mn oxides formed in nature, e.g., birnessite, are poorly crystalline in general, which may well have compounded our inability to collect structural information . Transmission electron microscopy or synchrotron-based x-ray methods represent useful follow-up methods to characterize the rock varnish in this study [12, 22, 23]. The composition of the varnish likely represents multiple phases, a Mn-rich oxide and an Al-rich silicate mineral. The aluminous phase is either intimately mixed with Mn oxide or results from sampling a clastic mineral grain substrate. Unmixing the convolved chemistry by extrapolating negatively correlated Mn–Si and Fe–Si to a zero Si concentration end-member yields a Mn/Fe ratio of 20. Similar negative correlations between Si and Mn have been noted in desert varnish [8, 24]. The Mn-rich component within the nanophase mineral mixture is most likely either birnessite or todorokite. Potter and Rossman  found that different terrestrial weathering environments produced distinct mineralogy. If birnessite is the Mn-rich phase in the Smithsonian Castle varnish, the result is consistent with subaerial Mn varnish formed in stream deposits where birnessite is found in association with minor silicate minerals. Apart from an extreme enrichment in Mn relative to the Seneca sandstone, the varnish is additionally concentrated in a number of heavy metals, including Pb, Zn, Cu, and Ni. These results are consistent with experiments that have determined divalent metal preferential adsorption for Pb, Zn, and Cu on interlayer crystallographic sites in birnessite . Analytical studies also show a significant enrichment of Mn, Co, Pb, Ni, and Cu in desert varnishes [24, 26]. According to previous investigators, e.g., [7, 10], the mechanism of formation of Mn rock varnishes involves multiple steps: (1) accumulation of externally derived clay-bearing dust on a rock surface , (2) transport of Mn to the rock surface in solution within rain/fog droplets, and (3) oxidation and precipitation of Mn oxide cementing previously unconsolidated clay into a heterogeneous nanophase mixture. Step 1 was recently bolstered by the observation that anticorrelated Mn and Si electron microprobe analyses for desert varnish have a common Mn-free end-member regardless of the composition of the varnished rock . Regarding step 2, one may question whether Mn is derived locally from the host rock or externally via atmospheric transportation . In this study we report the presence of hematite, titanite, and rutile in the Seneca sandstone, which may all serve as internal reservoirs of Mn. However, to within the sensitivity of our compositional imaging we find no evidence for solution transportation of Mn in the sandstone. Based upon rare earth element fractionation observed in desert varnish it has been argued that the degree of element fractionation observed is inconsistent with isochemical leaching and reprecipitation within the same rock . Therefore, the source of Mn must be delivered to the rock surface externally via atmospheric transport and surface leaching/dissolution of airborne dust grains. The final step 3 requires oxidation and precipitation of Mn either by a physiochemical process under acidic oxidized conditions in rainwater  or via microbially assisted oxidation as favored by other investigators [7, 11, 27]. The microstructural imagery collected on the Smithsonian Castle varnish offers no evidence for microbial entombment in Mn oxide, and the organisms observed on the surface (Fig. 14) grew upon the varnish and therefore may not be related to Mn oxidizing microbes. Apart from local compositional heterogeneity discussed above, another factor to consider regarding the likelihood of varnish development is stone roughness. Rougher areas provide increased surface area for condensation and therefore deposition of atmospheric dust. However, no systematic associations between surface roughness and rock varnish have been noted on the building stone and gateposts. “the irregular onset of bacterial colonization accounts for the puzzling inconsistency in varnish development from stone to stone…” . The rate of subaerially exposed Mn varnish formation in the western USA has been estimated to range between <1 and 40 nm/a . Given that the age of the Castle gatepost exposure to the atmosphere is known to be just under 30 years, a rock varnish thickness range of ~28 nm–1.08 μm would be expected using the rates determined for the western USA. The observed surface coating is closer to the lowest end of that thickness range, although Mn-rich particles sequestered in pores within the sandstone do not contribute to the surface thickness estimate. A rare 20–40 year old rock varnish has been reported forming on steel slag piles in southern California , where the substrate material is rich in Mn, possibly influencing the rapid rate of growth. 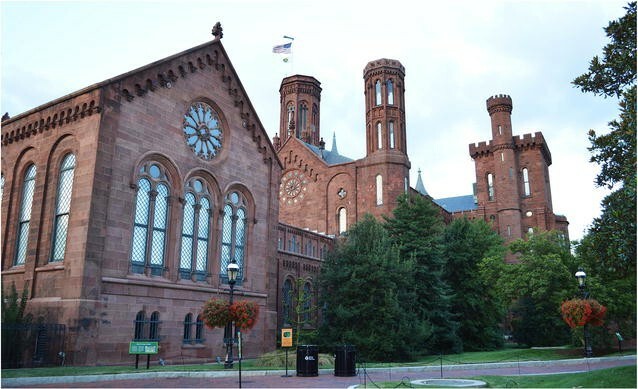 Impressively, in a few short decades stone disfigurement of the Smithsonian’s Castle is readily noticeable and a testament to the strong pigmentation of Mn oxides even when present in small concentrations. Removal of varnish from the stone may prove problematic. While laser cleaning can be used to remove the exposed coating it will be more difficult to remove Mn oxide within pores without damaging the sandstone. 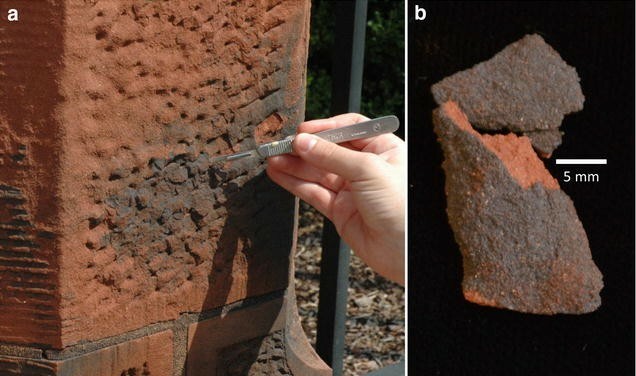 Rock varnish on Smithsonian Castle is comprised of a discontinuous thin film (≪1 μm) of Mn-rich and Al-rich silicate nanoparticles on Seneca sandstone. Mn-rich particles range from <20 to 200 nm in size. 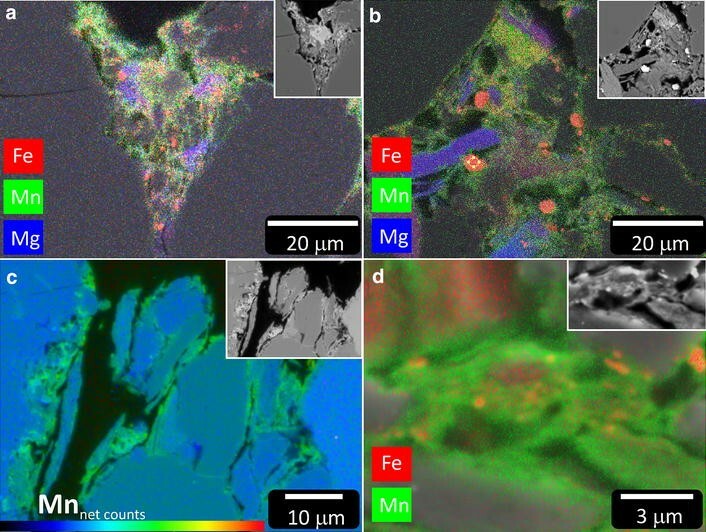 The nanoscale mixture also decorates the grain boundaries and cavities of the uppermost 100–250 μm of the rock-atmosphere interface, strongly altering the color of the red stone to lustrous black despite the relatively small mass of the deposits. The varnish is poorly crystalline and has an estimated composition of Na0.2Ca0.1Mg0.1Al0.1Si0.5Mn1.9Fe0.5O6.7. It is likely that this Mn-rich composition represents an intimate mixture of a Mn oxide, e.g., birnessite or todorokite, and Al-rich silicate dust. The Mn/Fe ratio of the Mn-rich end-member is estimated to be ~20. The rock varnish on the Smithsonian Castle is both thinner than typical desert varnish by a factor of 100 s–1000× and lacks microstratigraphy. Both differences may be accounted for by the much younger age of the architectural varnish compared to varnish deposits formed over glacial to geological time frames. A significant mass of Mn-oxide is held more deeply below the rock surface (within the upper 250 μm), principally along mineral surfaces within pores, which complicates estimates for the rate of Smithsonian varnish formation. EPV conducted laboratory-based portable XRF measurements and data analysis, collected all scanning electron and x-ray spectroscopic imagery, and performed all data analysis and interpretation. CAG coordinates the research project on rock varnish of the Seneca sandstone at the Smithsonian, performed field and studio photography, and provided the historical architectural context for the study. RAL first recognized the significance of the black patches while conducting a separate investigation on the properties of building stone and has led other studies of the problem. ZW-Y performed photography, researched buildings in the Washington, DC, region built of Seneca sandstone, and annotated architectural elevations showing the location of the black patches. EPV wrote the paper with input from CAG and RAL. All authors read and approved the final manuscript. We would like to thank Emily Aloiz, who initially analyzed the Seneca sandstone and documented its condition; Jennifer Giaccai, Willa Freedman, and Gwénaëlle Kavich, who performed the field-based XRF analyses of the Smithsonian Castle rock varnish; and Melvin Wachowiak, who collected light microscopy images. EPV acknowledges the Materials Measurement Science Division of the National Institute of Standards and Technology, where he performed some of the electron microscopy presented here as a guest researcher. We also thank the Smithsonian’s Museum Conservation Institute for generous support for the project. EPV is a research scientist at Smithsonian’s Museum Conservation Institute and president of the International Union of Microbeam Analysis Societies. Since 1984, CAG has been Senior Objects Conservator at the Smithsonian Institution, where she has been particularly concerned with the conservation of artifacts and buildings made of stone. RAL has been involved with stone conservation since 1978. ZW-Y is an undergraduate at the University of Maryland majoring in art history, who participated in the project as a summer intern.